WHAT IS A1C TEST FOR DIABETIC | A1C Test Definition. What is A1C Test For Diabetic? The A1C test is always carried out to find out if someone is suffering from diabetes, either type I or type II. It is a blood test which is also used to see how well you are controlling your blood sugar levels. Other names given to the A1C test are glycosylated hemoglobin, glycated hemoglobin, HbA1c, and hemoglobin A1C. The A1C test shows the average level of your blood glucose for three consecutive pre-test months. The main purpose of the A1C test is determine how much of the hemoglobin in your red blood cells is covered with glycated (sugar). A bigger percentage implies poorer control over your blood glucose. Should you be already diagnosed as a diabetic, the bigger percentage carries with it the greater possibility of diabetes complications. After giving you a diagnosis of diabetes, the A1C is again used to check on the effectiveness of your treatment plan. As the A1C measures the average blood sugar level for the last three months and not your level of blood glucose at a particular time, it shows a better picture of the overall effectiveness of your treatment plan. It is most probable that your doctor use the A1C test when he diagnosed you for diabetes as the result can be used to give a starting A1C level. He will then do the test again during your initial treatment when you will be trying to manage your blood glucose level. Two times a year for a type II diabetic who uses no insulin and has good control over blood glucose levels. Three or four tests per year if you are a type I diabetic. Four tests per year if you are a type II diabetic who uses insulin or you cannot manage your blood glucose levels well. Even more frequent testing if your treatment plan has to be adjusted or you are prescribed with some new medication for your diabetes. You are allowed to eat and drink as you usually do before this simple A1C test. In the A1C test, a nurse or doctor draws out some blood from a vein with a needle. The blood is then analyzed in a lab. You can immediately go back to any activity. For non-diabetics, the A1C level should be between 4.5 – 6 %. A result with the A1C level of more than 9 % indicates poorly managed diabetes for quite some time. Should an A1C level of 6.5 or more be shown in tests on two different occasions? It’s a sure indication of diabetes. When test result is between 5.7 – 6.4 %, it is prediabetes which most probably leads to diabetes. For diagnosed diabetes, an A1C level of 7 % or loweris the usual target in your treatment. However, certain people may choose targets higher than 7 percent. If you are found to have levels higher than your target, it is an indication to your doctor that your diabetes treatment plan needs a change. This is the best move as when your A1C level rise, so does the possibility of getting complications. 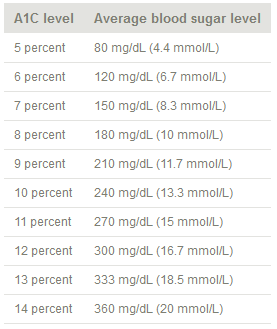 This shows how an A1C level is equivalent to an average blood glucose level, in mmol/L. (millimoles per liter) and mg/dL(milligrams per deciliter). If bleeding is chronic or heavy, your hemoglobin count can be very much lower and this can cause your A1C level to be incorrectly low. If your blood has insufficient iron, it can result in your A1C level being high but for a different reason. Many people are found with one type of hemoglobin, known as hemoglobin A. However, you could be one of those few with an unusual form of hemoglobin (hemoglobin variant). If you have this form of hemoglobin, your A1C level may come out either high or low, with both not true. Hemoglobin variants are usually found among blacks and those of Southeast Asian or Mediterranean heritage. A lab test can confirm if you have hemoglobin variant. And if your do, you need your blood analyzed in a specialized lab to get your A1C results as accurate as possible. When it comes to A1C tests, you have to understand that the usual range for the results can differ a little in a different lab. So, if you go to another doctor or lab, take into consideration the probable difference when understanding the results of your A1C test.